BAA continues to use any opportunity it can to push its ambition to expand Heathrow. It has used the January traffic figures as another chance to lobby for its 3rd runway and trot out its capacity argument. Passengers from Heathrow to China, including Hong Kong, rose by 3% in 2011, but happened to fall by 0.7% in January, compared to Jan 2010. BAA could not confirm whether other airports suffered a similar dip in January traffic. BAA imply, but there are no publicly available figures to check, that traffic to China from Frankfurt and Amsterdam rose in January. Germany exported £27 billion to China in 2010 and the UK exported £5 billion. Research carried out by WWF and AirportWatch in August looking at weekly flights (July 2011) showed Frankfurt had 43 flights to China, Paris Charles de Gaulle had 81 flights, Schiphol had 40 ….. and Heathrow had a whopping 94. It’s not really falling behind, in any meaningful sense of the word. Heathrow flew 954,000 people to Miami last year (2010), compared to 311,000 to Beijing and 352,000 to Shanghai. It’s a question of demand and priorities, and it seems we attach greater priority to the beach than to business. Last year there was a report of the size of exports to China. Germany exported £27 billion to China in 2010 and the UK exported £5 billion. How well connected are UK airports to the world’s main business destinations? 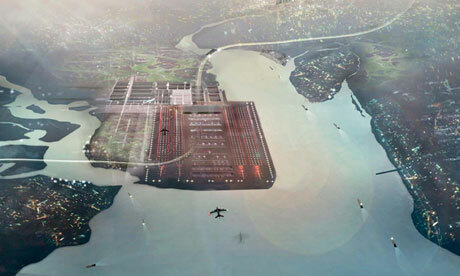 Foster and Partners artist impression of the Thames Hub, a four-runway Thames estuary airport. BAA drove another nail into the long-term prospects of the Kentish grey heron on Monday morning with the latest contribution to the national debate over airport capacity. Britain’s largest airport group craves a third runway at Heathrow airport but that is highly unlikely, so every noise it makes on the need for more capacity plays into the hands of Boris Johnson‘s estuary airport campaign. The grey heron is the collateral damage here: it joins the avocet, little grebe and ringed plover among the birds that would be endangered by a four-runway behemoth appearing off the Isle of Sheppey. BAA’s January figures seem healthy enough, handling a record 5.2 million passengers – up 2.3% on the same period last year. But traffic to China fell by 0.7%, allowing enough of a gap for BAA to trot out the capacity argument. BAA could not confirm whether other airports suffered a similar dip in January traffic. Developing markets are a key factor in the capacity argument, with Matthews and Johnson united in arguing that lucrative destinations in China, India and Brazil are being cut off by the lack of runways in the south-east. However, it is Johnson who is likely to benefit most from BAA’s statement. London’s Heathrow is falling behind rival European airports in the battle for lucrative routes to China because of the constraints on growth at Britain’s largest airport, operator BAA said on Monday. BAA, which was prevented by the UK government from building a third runway at Heathrow because of environmental concerns, said passenger traffic at its British airports edged up last month with Heathrow enjoying its busiest ever January despite a slight fall in traffic to China. “Heathrow’s China traffic in January, including Hong Kong, was down by 0.7% versus the previous year. Through 2011 as a whole, Heathrow’s China traffic was up 3% versus 2010,” Chief Executive Colin Matthews said. Heathrow is operating at full capacity after Britain’s Conservative-led coalition government blocked development of a third runway when it came to power in 2010 as further expansion of the west London site would mean a huge increase in the number of planes flying directly over the capital. London Mayor Boris Johnson has instead proposed building a new London hub airport in the Thames estuary. There were 476,197 flights at Heathrow in 2011, representing 99.2% of the airport’s limit. A recent study by the Frontier Economics consultancy said Paris Charles de Gaulle and Frankfurt airports boast 1,000 more annual flights to the three largest cities in China than Heathrow. It added that a lack of direct flights to emerging markets was costing the UK some 1.2 billion pounds a year as trade goes to better-connected competitors. Earlier this month a report by business group London First said Britain should consider a new runway at Heathrow and allow planes to land and take-off simultaneously on its two runways. The report, which criticised the government for ruling out expanding Heathrow for political reasons, said all options for meeting the UK’s long-term need for further airport capacity, including a new airport, should be considered. BAA is owned by a consortium of institutional investors led by 49.9 percent shareholder Ferrovial, the Spanish transportation infrastructure group. Ferrovial’s shares in Madrid were flat at 9.48 euros by 1030 GMT, valuing the company at around 7 billion euros. Analysts at BPI believe Heathrow has outperformed in spite of restrictions on its growth. It expects Heathrow traffic to increase by a further 1.6 percent in 2012, supported by the London Olympics. BAA owns London’s Heathrow and Stansted as well as Southampton, Glasgow, Edinburgh and Aberdeen airports but has been ordered by competition regulators to sell Stansted, having already sold London Gatwick in 2009. BAA said it handled 7.5 million passengers in January, up 0.5 percent. Heathrow served 5.2 million passengers last month, a record for January and up 2.3 percent on a year ago. Qantas has said it will close some international routes and cut almost 500 jobs after its profits were hit by an industrial dispute and rising fuel costs. The carrier made a net profit of 42m Australian dollars ($45m; £29m) for the six months to the end of December.Qantas has been trying to restructure its international operations in a bid to make them more profitable. The firm said that it will close the Singapore-Mumbai and Auckland-Los Angeles routes from 6 May this year. It has already announced withdrawals from the Hong Kong-London and Bangkok-London routes from March. Posted: Tuesday, February 14th, 2012. Filed in General News, News about Airports, Recent News.